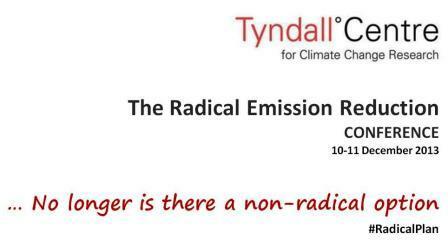 A Climate Change conference on Radical Emission Reduction will take place at the Royal Society in London on 10-11 December 2013. It will end with a poster session with a reception. The Tyndall Centre for Climate Change Research is a partnership between a selection of researchers from eight UK universities, namely Cardiff, Newcastle, Cambridge, East Anglia (headquarters), Manchester, Oxford, Southampton and Sussex. Together with contributions from Fudan University in China, the Centre forms the Tyndall Consortium. Driven by its vision, ‘To be an internationally recognised source of high quality and integrated climate-change research, and to exert a seminal influence on the design and achievability of the long-term strategic objectives of national and international climate policy,’ The Centre aims ‘to research, assess and communicate from a distinct trans-disciplinary perspective, the options to mitigate, and the necessities to adapt to, climate change, and to integrate these into the global, UK and local contexts of sustainable development.’ It works not only within the research community, but also with business leaders, policy advisors, the media and the public in general.